From September 1-7, 2018, longtime Indy-based activist Richard Propes, a paraplegic/double amputee with spina bifida, once again traveled the roads & trails of Indiana for his 29th annual Tenderness Tour, his nationally recognized event that he started in 1989 with a 41-day, 1086 mile wheelchair ride around the State of Indiana. For the 2018 Tenderness Tour, Propes wheeled nearly 100 miles along the Nickel Plate Trail from Kokomo to Rochester before moving over to the Cardinal Greenway in Richmond and riding it all the way to Muncie, Indiana. He also wheeled Muncie's White River Greenway on the tour's final day in a driving rain accompanied by his road crew, Anne Burget, and a peer from work, Danielle Sparks. Since 1989, Richard has hit the road annually accumulating over 5,000 miles and raising thousands of dollars in this grassroots effort that can be summed up as one man, one wheelchair, and one mile at a time at 2-3 miles per hour. The 2018 Tenderness Tour successfully established the Tenderness Award, a $500 annual scholarship, at the Erskine-Green Training Institute in Muncie, Indiana. The scholarship, awarded annually in October to a student with a physical disability, will support Erskine-Green's mission to provide individuals with disabilities the skills necessary to enter a variety of community-based, market-wage careers. The goal was to raise $5,000 to fund the scholarship for 10 years - Propes raised over $6,000 and funded the scholarship for 12 years. 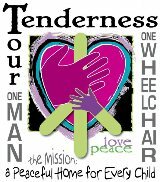 The first Tenderness Tour started out of Propes's desperation to discover "tenderness" in the world, a mission accomplished throughout his 41 days traveling the roads of Indiana alone in his wheelchair. After returning safely home, Propes knew he had a life mission to break the cycle of abuse/violence, share hope, create opportunities and to embrace life at 2-3 miles per hour. Since 1989, he's wheeled all over the country in his wheelchair while building a better life for himself as an acclaimed writer, film journalist, activist, ordained minister, and program director for a state agency in Indiana. Over the years, Propes has received numerous awards for his efforts including the Sagamore of the Wabash from the State of Indiana, the Order of Kentucky Colonels from the State of Kentucky, the Donna J. Stone Award (Prevent Child Abuse America's highest honor), and others. Propes is the author of the award-winning book "The Hallelujah Life" and the founder/publisher of TheIndependentCritic.com, one of the most popular online film review websites. Visit to Village of Merici in Indy, AM (9am, est.). Speak to EGTI Students - 8am. Find out more about the Erskine Green Training Institute by visiting the institute's website. In October 2018, Richard presented the first Tenderness Tour Award scholarship to Erskine-Green Training Institute student James Winfield of Hammond, Indiana! 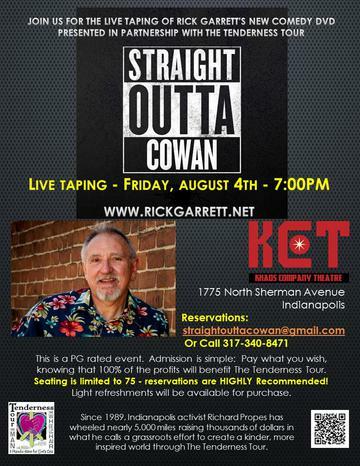 After an August 4th, 2017 live recording of his one-man show "Straight Outta Cowan," Indy-based stand-up comic Rick Garrett has dedicated 100% of the profits from his just released DVD of the show to benefit the Tenderness Tour's efforts to establish the Indiana Children's Labyrinth in Indianapolis. A packed house watched Garrett on August 4th as he performed live at Khaos Company Theatre where he also donated 100% of the show's profits to kick off the labyrinth's fundraising efforts. Rick’s brand of comedy has entertained churches, the USO, comedy clubs, pubs, private events, and much more. Rick has an easygoing, down home demeanor that makes everyone in the audience believe he is talking personally to them. In fact, he is. He takes great pride in personally connecting with an audience before, during and after the show. With a diverse background that includes being in the Ministry, a firefighter/paramedic, tour bus driver, and touring musician,Garrett’s comedy is part storytelling, part slapstick, and 100% genuine. Rick Garrett works with a number of fantastic comedians, whose credits include Comedy Central, The Tonight Show, VH-1, Las Vegas, and more. Watch this space for upcoming DVD release shows to celebrate! You can order your own copy by sending $10 plus $2.95 for shipping & handling via Paypal to - tendernesstour@ameritech.net! For the third year, Richard will be observing "The Longest Night - A Remembrance," a Facebook Live webcast reading of the names of children who've died as a result of violence throughout the United States during 2018. The evening's memorial, on what is known as the longest night of the year, continues Richard's longstanding dedication to remembering child victims of violence. "The Longest Night - A Remembrance" will begin at 7pm. Richard will read the names of child victims of violence from each state in the United States. While there is no consistent tracking mechanism for child victims of violence in the U.S. or any other country, Richard has long maintained the web's largest online memorial to child victims of violence, One Million Acres," and utilizes sources from throughout the world to track child victims of violence in every state and 101 countries. "One Million Acres" is in the process of being turned into a physical memorial in Indianapolis and for the past several years Richard has also run a 24/7 listening line. I can remember being a young man and being in awe of Bob Wieland, a Vietnam veteran who lost his legs to a mortar mine in 1969. Wieland likes to say of that day " "My legs went one direction, my life another." Wieland "ran" across America on his hands, taking three years, eight months, and six days to travel from coast to coast. Over his life, he's ran many marathons and often takes days to finish. In 1989, I started The Tenderness Tour with $20 in my pocket, a backpack on my wheelchair and no real clear idea which direction my life was headed. A paraplegic/double amputee born with spina bifida, by the time I arrived at that day in October, 1989 ready to embark on the first Tenderness Tour I'd already far surpassed most of my life's expectations. By the time I returned from that first Tenderness Tour of 41 days and over 1,000 miles, I'd discovered a goodness in the world beyond anything I'd ever imagined and a lifelong mission that continues to this day. Since 1989, I've traveled nearly 6,000 miles by wheelchair raising thousands of dollars for organizations working to end the cycle of abuse and violence. Indy's acclaimed Heartland Film Festival recognized the award-winning social justice work of Richard Propes by establishing the Richard D. Propes Social Impact Award during the 2018 Heartland Film Festival in Indianapolis this past October. Propes, a popular film journalist and longtime Heartland supporter, was recognized for his longstanding commitment for living into Heartland's core values of working tirelessly to improve the lives of others. During the 2018 Heartland Film Festival, the festival presented two Richard D. Propes Social Impact Awards - one for narrative feature and one for documentary feature with both winners receiving a $2,500 cash prize and trophy. The first recipients of the Richard D. Propes Social Impact Award were German filmmaker Stephen Lacant's "Strange Daughter" and Alyssa Fedele's powerful documentary "The Rescue List." Richard was on hand during the awards ceremony and presented both awards on behalf of Heartland Film Festival. For more information on Heartland Film Festival, visit the Heartland Film website.